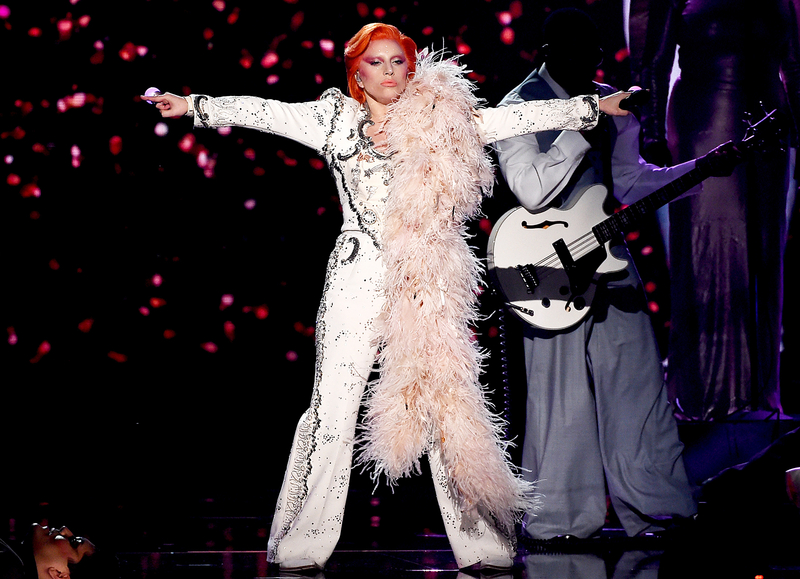 Lady Gaga pulled out all the stops for her David Bowie tribute performance at the Grammy Awards on Monday, February 15. The eccentric singer wore an outfit inspired by Bowie’s Aladdin Sane look for her show-stopping routine, which covered some of Bowie’s biggest hits. On Saturday, Gaga proved her dedication to the music icon by getting a tattoo of his face on her left rib cage — a process she documented via Snapchat. Prior to her performance on Monday, an insider told Us that the much-anticipated production was going to feature plenty of cutting-edge technology. “It is going to be super high-tech — there are dancing robots and a lot of other very sophisticated technology being used in her David Bowie tribute,” the source said. Grammy producer Ken Ehrlich told The New York Times that the tribute was meant to acknowledge all aspects of Bowie’s creative spirit. “[It] is going to be a true homage to who David was, particularly musically, but not ignoring his influence on fashion and pop culture in a broader way,” he said.